We let you in on all the basics for buying and using blush and the tips that will makeover your cheekbones. Blush isn't just for adding a healthy glow to your face, it also helps to bring out your cheekbones, enhance your face shape and has lots of other great uses and tricks that will help you to create a great look. The main use of blush is to put some color on your cheeks. This will also help enhance other makeup, such as your eye shadow, foundation and lipstick. Look in the mirror and smile to bring out the apples of your cheeks. Use a large blush brush to sweep your blush color directly onto your cheeks. If you want more from blush than just a pretty, feminine glow then you'll need to know what blush colors to buy, how to apply it and how to use it to makeover your cheekbones to bring out the best in them. To find the most natural and flattering blush shade for you, pinch your cheeks and then look for a blush shade that closely matches the color that appears. To avoid an overdone makeup look, steer clear of a blush color that is the same as your lipstick or your natural lip color. If you have greasy skin then powder blush is your best bet. Creamier blushes can give an oily finish and will only highlight the oiliness of your skin tone. To get a natural blush finish try using mousse or gel blushes as they are usually more translucent than powder blushes. For a daytime blush look that will blend well in natural sunlight, stick to soft and natural colors in pink, beige and peach shades. For a nighttime look (which calls for a more dramatic and heavier finish), buy brighter, darker blush shades. When shopping for a blush color, apply makeup testers on the inside of your wrist. If it suits your skin tone there then it will suit your cheeks. Use your fingers to apply cream, stick or liquid blushes, and large blush brushes for powder blush. The little blush brush that comes with some makeup brands is good for applying your blush in a defined, direct place, but if you want a more natural finish or you’re a first-time blush user, then a larger brush which creates a softer, low-fuss finish is your best tool. As a general rule, don’t take your blush right up to your hairline. Instead stop when you get to the top curve of your cheekbone or you’ll end up with a very unnatural blush finish. Blow or shake off excess blush from your brush before you apply it to your cheeks to avoid an overdone look. Less is always more and it’s better to build up your color rather than just applying as much as you can first go. If you’ve gone a little overboard on the blush or ended up with a stripy finish then use a tissue to blot off (don’t rub) the extra powder and then dust some translucent powder over your cheeks to tone down the shade. When applying cream blushers, always start with a few small dabs of color on the apples of your cheeks and then blend out in small circular motions. Use a blush brush with natural bristles for a softer touch when applying the blush to your skin and for your end result. Keep your use of blush in check by applying it in a room with enough light, using a light up mirror or by a window which has plenty of natural light. If you're applying a bright lipstick then stick to neutral, natural blush shades and vice versa. To really bring out your cheekbones, try using a cream blush applied by gently patting it along your cheekbones. If you have wide cheekbones that you’d like to pull in (heart face shapes), apply blush to your cheekbones in a color that is one shade darker than your foundation and blend it out to your hairline. 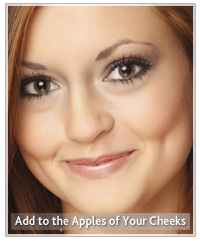 To give lift to flat cheekbones (square face shapes), apply a light colored blush on your cheekbones and over your chin. To enhance the wide cheekbones of naturally narrow faces (diamond face shapes), apply your blush just below the cheeks and then blend it over the width of your cheeks. This will further enhance the natural width across the centre of your face and continue it out to your cheeks. For bottom heavy faces (triangular face shapes) that need a narrower appearance, apply a light blush color across your cheekbones and right up to your hairline. If you want to make your cheekbones stand out then apply a medium beige blush shade underneath your cheekbones. Anything darker will just give you a very odd looking stripy line and draw attention to your cheekbones in the wrong way. If your cheekbones are really sharp looking try applying your blush using small circles to just the apples of your cheeks to create a much softer line. Our final tip, even if you don’t have time to apply any other makeup, a dab of cream blush applied to your cheeks gives a great natural flush that will instantly warm up and enhance your skin tone! We hope these blush basics and tips will help you create a great look for your cheekbones.